The Mass Entry tool allows you to enter Donations, Interactions, and/or Volunteer hours in bulk. The video covers the process for building a Donation-based mass entry, however the process is the same for Interactions and Volunteer Hours. 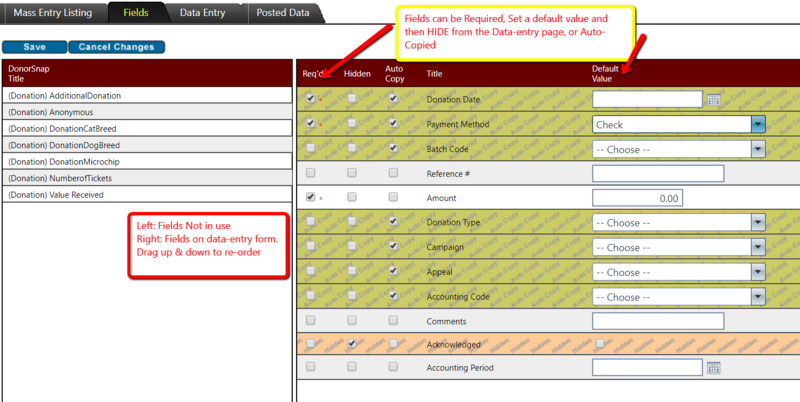 Use the Fields tab to design the data-entry form. Drag fields from the left (Not Used) box to the right. Drag fields up and down to re-order fields (remember on the data-entry screen, you can TAB through the fields so put them in order that makes the best since to your data entry team). Default Value: Set a default value – for example, if you create a mass entry for the Golf Tournament, all payments through this process will have certain set crtieria, such as DonationType = Event Registration and Appeal = Golf Tournament. Hidden: If you set a default value for a field, you can now Hide the field from the data-entry page. Information will still be submitted to DonorSnap. Auto-Copy: Auto-copy information from one submission to the next. For example, Payment Method is a good one for this field. Enter your first payment and define “Check”. The next payment will have Check copied in to the Payment Method field. Once you’ve set up the fields of your Mass Entry as needed, use the Data-Entry tab to start entering! Choose your contact by searching for First, Last, or Company name. Click the blue New Contact button to add a brand new Contact. Once you save the contact, it will be the Contact you’re adding the payment for. Click the Add button when you’re finished with that entry; the addition will appear at the bottom of the screen and your cursor is read back at the Contact field to search for the next submission. Click Post at the bottom to post all entries in bulk. The Posted Data tab will show all submissions through this mass entry form. 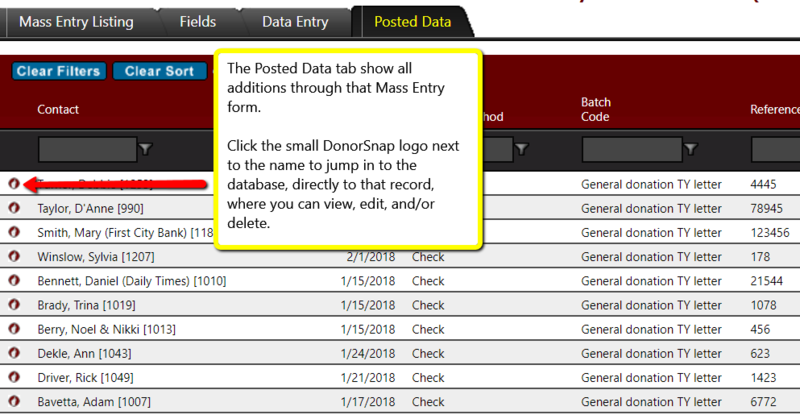 Click the DonorSnap logo next to the contact name to enter the database where you can now view, edit, or delete. For more information about the Mass Entry tool, watch the 30 minute webinar. **NOTE** If you have a spreadsheet of donations, interactions, or volunteer hours of 50+ more, consider importing that spreadsheet directly from Excel. Click here for a webinar on the Excel Import tool.